Maybe the title is a bit misleading, we bought a cow share, not the entire cow. :-)Nevertheless, the kids love telling people they have a new pet and it’s a cow! Here in the state of TN, it is illegal to purchase raw milk for human consumption.So buying a share of a cow is a great solution. There are some pretty stiff penalties for farmers that break the law, they could even go to jail for selling you milk that hasn’t been pasteurized. However, buying a share of a cow allows you to enter into an agreement with your local farmer, you pay a one-time fee for your share of the cow. This usually runs between $25-$50. Then you pay a boarding fee monthly for the farmer to take care of the cow. In exchange, you get your share of milk, cheese, etc. This fee will depend on the size of the share and how many shares you purchase. This process makes it all lovely and legal in the state of TN to consume raw milk. We just discovered a farm a few miles from our house that was offering cow shares. We met Morel Bliss and toured Green Chin Farms. The kids were excited to meet ‘Crema’, she’s a two-year-old Jersey that grazes daily on organically kept pastures. Isn’t she cute? Morel was very open about showing us the farm and explaining the process she takes to ensure the milk is kept clean and safe. I was excited to learn it is now legal in TN for Green Chin Farms to process the milk into cheeses, kefir, etc. This will come in handy when we are away on vacation, we can come home to some fresh cheese instead of sour milk. 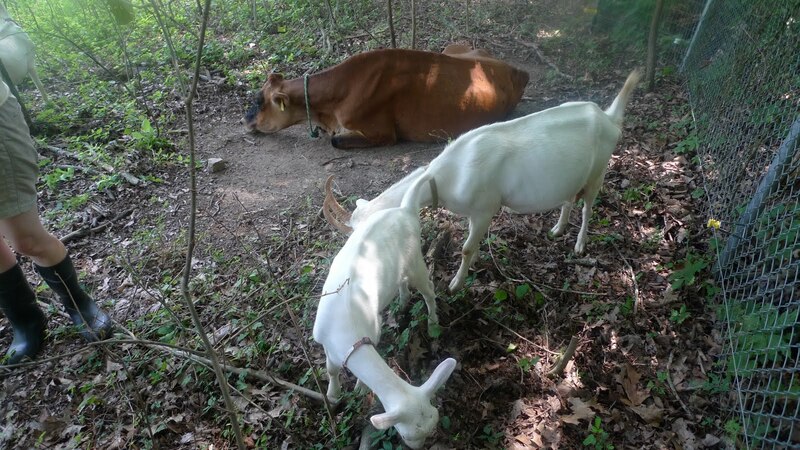 Green Chin Farms will soon be offering goat shares. In exchange for your monthly boarding fees and one-time share fee, you’ll be able to enjoy some chevre or feta each week. Finding delicious healthy local foods is so exciting. It was awesome to find Green Chin Farms right up the road. They are so passionate about organic, sustainable farming. It makes me feel so good to support them and even better to feed their milk to my family. 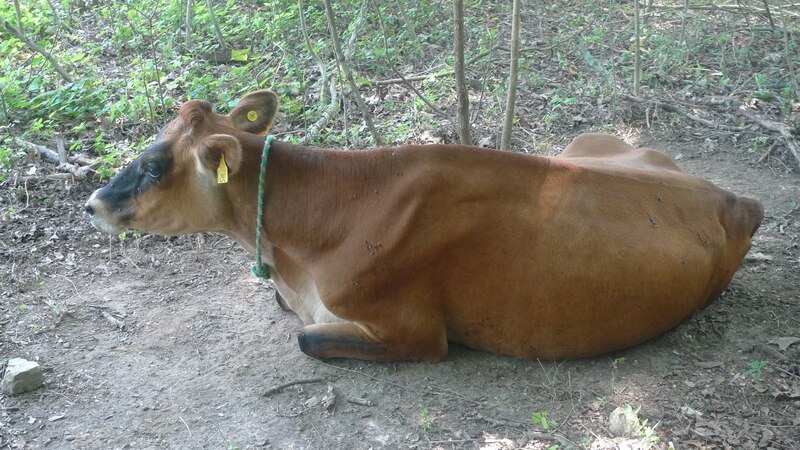 We also know ‘Crema’ is taken well care of, she is not in a feed lot in unsanitary conditions, but rather she is enjoying a leisurely life of grazing in the field. Morel also shared with us that they are going to soon be putting in place the Joel Salatin method of moving the chickens behind Crema in the pasture. I was thrilled that I actually knew what that meant thanks to reading The Omnivore’s Dilemma. I remember reading about that concept in the book and thinking how brilliant and simple it was to have the chickens follow the cows in the pasture a few days later. This enables the chickens to eat the worm larvae from the manure and help to distribute the manure across the field. Why would I do this when I can buy milk at my local grocery store? I feel raw milk is more nutritious and tastes better than pasteurized milk. I feel good supporting local farmers for so many reasons. My kids can see the connection to our food and they know where their food comes from. I know I’m supporting my community and I can feel good knowing that our food is safe and untainted by large-scale farming practices. 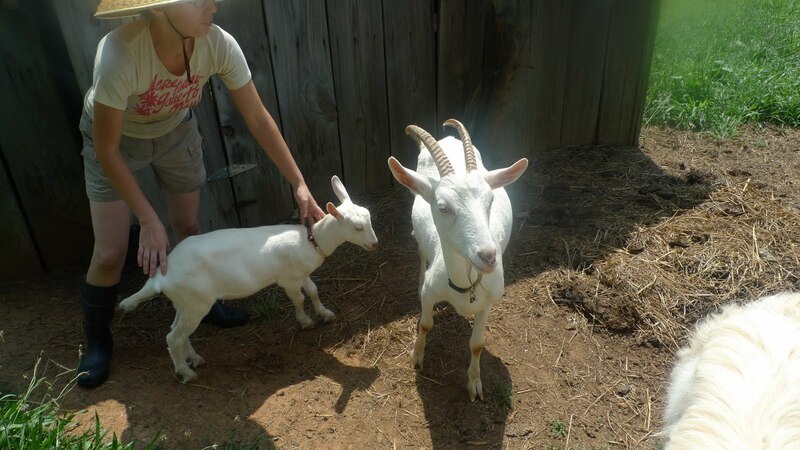 If you are local to the Knoxville area you may be interested in contacting Green Chin Farms. They do deliver to South Knoxville weekly. You can call Morel at 865-933-0855. If you live outside of the area and are interested in a raw milk share you can visit www.realmilk.com/ to find a farmer in your area. For more information about the benefits of raw milk and recipe ideas visit www.cheeseslave.com and www.gnowfglins.com. They are two of my favorite bloggers on the topic. Your local farmers market is a great place to connect with local farmers in your area. That is where we first met Morel in the beginning of the season. Have you found some great local resources for food in your area? I’d love to hear about it. This post is part of Simple Lives Thursday hosted in part by GNOWGLINS. How sweet We have five shares in a local herd and my kids LOVE to visit! The farmer lets them bottle feed the calves, move the cows in pasture, and even let the older kids run the tractor! It is si important that we know where our food comes from both for physical and our emotional health. Yes, we are still using Green Chin Farms. In fact, Crema just had a calf last night! We will be starting back with our milk shares soon. I’m not sure what openings they have, but they do deliver to different locations in Knoxville. We really do enjoy our milk. McBee dairy may be another option for you. http://www.mcbeedairyfarm.com/ thanks!